THE LIFE WE SHARE: WILL EIGHT BE ENOUGH? Today we finished planting tomato plants. Eight in all. Aligned in a row, 5 in one raised bed and 3 in another. As a temporary measure, to protect them and keep them warm, each one is in a plastic wrapped cage, two feet in diameter and four feet high. Behind each plant is a trellis two feet wide and 8 feet high. 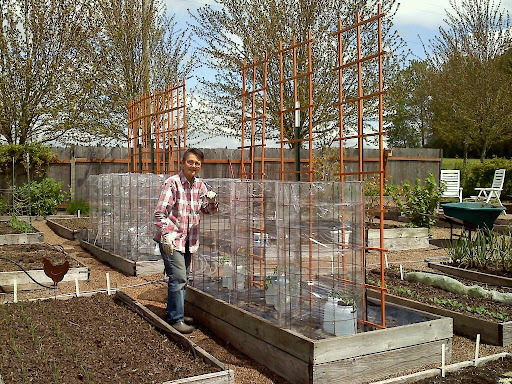 The plants will be pruned and trained and tied to the trellis. There are already blossoms on all of the plants. The jugs you see at the base are filled with water to retain the heat from the day thus warming the plants at night. WOW! That's all I can say is ... WOW!